Integrate your Selenium test suite with Bamboo and the BrowserStack Selenium grid using our plugin. Bamboo is a continuous integration server that allows you to build, test and deploy your web applications. Our Bamboo plugin enables the integration between your Selenium Webdriver tests, Bamboo and the BrowserStack Selenium grid. 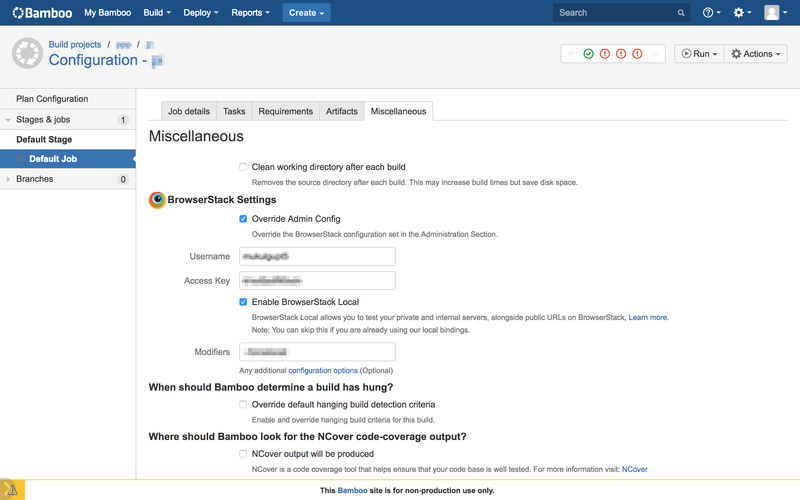 Configure your BrowserStack credentials for your Bamboo jobs. Set up and tear down the BrowserStack Local binary for testing websites hosted on internal, private or development servers. Embed BrowserStack test results, including video, logs, and screenshots in your Bamboo job results. Before installing the plugin please make sure that you have the necessary privileges to administer your Bamboo installation. We recommend that you do this when there are no active build jobs running on Bamboo. Click the admin dropdown (Settings icon on the top menu) and choose Add-ons. The Manage add-ons screen will load. Click Find new add-ons, located under the the ADD-ONS section on the left-hand side of the page. Locate BrowserStack Plugin for Bamboo via search. Results include add-on versions compatible with your Bamboo instance. 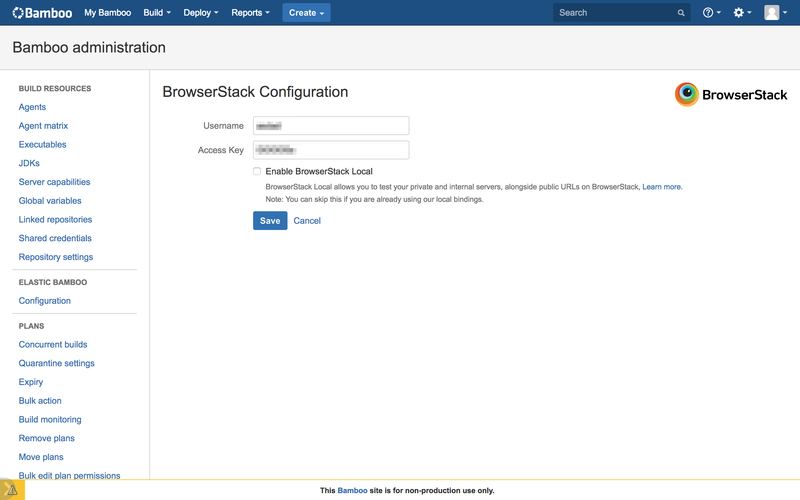 Go to Settings > Overview > BrowserStack Configuration in the Bamboo administration control panel. Add your BrowserStack Username and Access Key. You can now trigger your Selenium tests to run on BrowserStack through Bamboo. Check Enable BrowserStack Local in the BrowserStack Configuration section. Note that in case you're already using BrowserStack Local through our bindings, you don't need to check this. Once you've integrated BrowserStack Local through the Bamboo plugin, you can run your Selenium tests on websites hosted on private, development, and internal servers safely and securely. Check Override Admin Config inside the Miscellaneous tab for the job. You will now be able to enter your BrowserStack credentials. Check Enable BrowserStack Local to test on your local development servers. 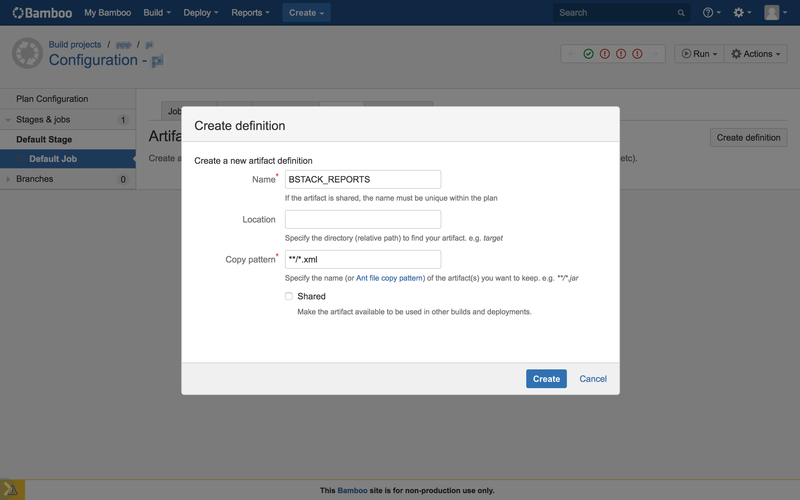 Create a new artifact named BSTACK_REPORTS which stores all of the **/*.xml files generated by your test suite. By following the steps outlined in this guide, you should have a seamless integration between your existing automation in Bamboo, your Selenium tests and the BrowserStack Selenium grid. This will help you leverage all the benefits of test automation and the scale and coverage offered by BrowserStack.